Now that you have done your PADI class and pool work you are ready for your Open Water Certification Dives. Complete your PADI Open Water certification during two half days of diving at beautiful Square Lake, approximately 5 miles north of Stillwater, Minnesota. Space is limited on each dive, so pre-registration is required. Due to PADI Instructor-to-Student ratios, 10 and 11 year olds must complete their Open Water Certification Dives during one of our Tues. / Thurs. evening sessions. At least a week before your dives you will need to stop in either store and try on a wetsuit for the dives and have a digital photo taken for your PADI certification card. 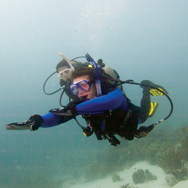 Includes: PADI Open Water Certification fee, scuba equipment use (tank, weights, regulator, BCD, 6mm wetsuit, & hood). Not included*: Mask, fins, snorkel, boots, gloves, and parking fees. Don't forget to bring your log book to the open water training dives. There are two scheduled sessions per day. # 1 is 8:00am - Noon; # 2 is Noon - 4pm. You will need to attend the same session on both Sat. and Sun. Weekday afternoons scheduled on Tues. and Thurs. at 1pm.